Not only T.rex and Barosaurus, there is a new pre-historic giant is in town. And it will be displayed at the American Museum of Natural History. They call this creature Titanosaur and the show starts from this Friday. It is the biggest dinosaur ever to be displayed at the museum. It is one among the largest dinosaur discovered. This dinosaur is of 122 feet long and rise till a height of 20 feet almost to the ceiling. It weights approximately 70 tons, almost the weight of 10 African elephants. The cast model skeleton of Titanosaur is made of plaster-of-paris and with some well preserved bones which was discovered recently. It includes the huge 8 foot long thigh bone. The plaster cast bones were created using the new technology like scanning and 3-D printing. Diego Pol is one of the paleontologist who discovered and dug out the previous unknown dinosaur discovered in Argentina in 2014. He also has a main part in this process. 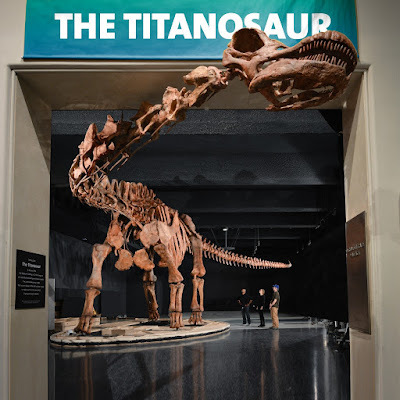 The term Titanosaur refers to a group of dinosaur with similar type and size. It is according to Don Phillips president of the New York paleontology society and a lecturer at New York University. "There are your classic long-necked, long-tailed, really big dinosaurs," said Phillips. "They are the largest land animals that ever lived". The scientist believe that it is a herbivore. On knowing this Phillips said "They were probably not much of a threat if you lived back then," and he added, "Unless you got stepped on by one." 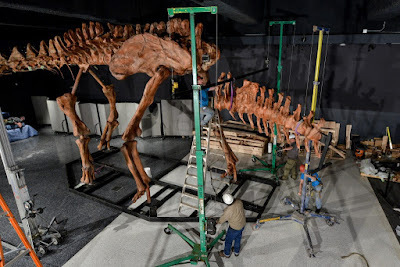 The dinosaur is installed in a walking pose with the neck more horizontal than vertical. It is the only possible way to install. If the neck is in vertical position it wouldn't fit inside the museum. In addition to that the head and neck of the Titanosaur is poked out of the fourth-floor hall towards the elevators. This provides the visitors an interesting introduction. Can dinosaur Come back to life?